Izzie lived on a farm with her parents, her grandpa, a herd of cows, a goat, a flock of sheep, two dogs, three cats, some chickens, and a dragon. 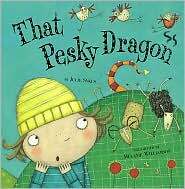 Everyone knew there was a dragon camping out near the well because they could hear its ferocious roar. Naturally Izzie wanted to go and look at the dragon but her father said that dragons “are far too dangerous” and if they left it alone it would just go away. The next morning the dragon was still by the well roaring away. Not only that but the chicken’s eggs were hard boiled and the cow’s milk had turned into yogurt. The morning after that Dad’s prize wheat was completely toasted to a crisp. Thoroughly fed up, Dad decided to call Remove-a-Dragon. Convinced that the dragon sounded more unhappy then angry, Izzie decided to check the dragon out for herself, before the dreaded Remover-a-Dragon people came. Sure enough Izzie was right. The dragon was not a threat at all. In fact the dragon was a dragon in distress! In this sweet picture book readers get to meet a very brave little girl who decides to follow her heart (and her ears) and who ends up helping an animal in trouble. All the grownups in her life are convinced that the dragon is a “mean one” and that it is “dangerous” and “fierce.” Izzie is the only one who considers that the dragon might be injured and in difficulty. Thank goodness for brave souls like Izzie!